2019 camps will be available from June 11 to August 13. If a session is full and you would like to be added to the waiting list, email the camp coordinator. Registration deadline is 2 weeks before start of camp session. Camps may fill before deadline, so early registration is recommended. Refunds will be given up to two-weeks before camp begins, minus a $10 service fee. Since 1991, Earth Focus Day Camp has created outstanding summer nature programs for children ages 3–14. 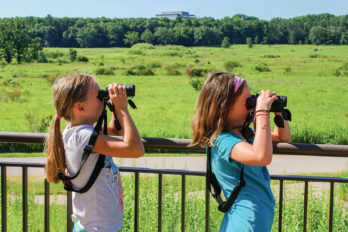 EFDC helps children develop an understanding of how ecosystems work, nurtures a sense of wonder for nature, and guides children as they explore the habitats, plants, and animals of the Arboretum. Children are empowered to be a positive influence on their world. Our naturalists are enthusiastic and experienced, but the real teacher is our most treasured resource: the land. Join us to learn, grow, and be a part of this special place. The day camp consists of five programs: Learning Together, Young Explorers, Explorers, Eco-Trekkers, and Afternoon Adventures. Camp activities include outdoor discovery hikes and observations, hands-on science exploration, and nature games and activities. Returning campers will find new and exciting experiences every year. Children are encouraged to ask questions, play, and share, create, discover, construct, and cooperate. Campers must come prepared to spend time outdoors, wearing long pants, socks, closed-toe shoes, a hat, and weather appropriate layers. A snack is provided in the morning and afternoon. Lunch care will be available from 12 to 12:30 p.m. for Explorers, Eco-Trekkers, and Afternoon Adventures campers. Lunch care cost is per session (sessions are either 3 or 5 days). Campers must bring their own lunch. T-shirts are provided to all campers if registration is received before June 1. T-shirt availability for late registrants will depend on remaining sizes and quantities. Scholarships are available through the Valerie Kerschensteiner Fund. For more information email us or call (608) 265-5872. 2019 camps are detailed below. Confirmations will be emailed. If you would like to be added to the waitlist for a camp that is full, email education@arboretum.wisc.edu. Read through camp descriptions below and note desired camps before proceeding to online form. 9:30–11:30 a.m. Ages 3 and 4, entering kindergarten, with an adult. $25, 1-day sessions. Children must be accompanied by an adult. Limit two age-appropriate children per adult. Only registered children may attend. Children and adults will explore nature topics through crafts, songs, stories, hikes, and games. 9 a.m.–12 p.m. Entering kindergarten and grade 1. $110, 3-day sessions. Great for first-time campers. Critters in the Garden: Discover the animals living in Arboretum gardens. We’ll investigate who lives here and how they make their homes. 8:30 a.m.–12 p.m. Entering grades 1–5. $105, 3-day sessions; $175, 5-day sessions. Campers will be divided into groups according to age. Bird Camp: Look and listen for birds as we hike the trails. We’ll explore the prairies, forests, wetlands, and gardens, seeking out these creatures of the sky. Insect Investigations: Discover and investigate the patterns and life cycles of insects as you explore their habitats. The Science of a Magical World: Dragons, herbs, and stories come alive as we delve into the science behind the magical plants and animals of the Harry Potter world. Entering grades 6–8. 8:30 a.m.–12 p.m. $175, 5-day sessions. Campers will delve deeper into topics and participate in citizen science and service learning projects. Science Outdoors: Explore Arboretum habitats to learn about plant and animal diversity. We will also bike around Lake Wingra to investigate additional sites. Bring your bike, or we will provide one. More information provided after registration. 12–12:30 p.m. Open to Explorers and Afternoon Adventure campers. $15, 3-day sessions; $25, 5-day sessions. Campers must bring their own lunches. Entering grade 1–5. 12:30–4 p.m. $105, 3-day sessions; $175, 5-day sessions. Campers will be grouped according to age. Animal Architects: Investigate how animals create amazing structures in nature and change the land around them in order to survive. Crazy about Spiders (or Not! ): Whether you’re fascinated or frightened by them, spiders appear in a vast web of myths and stories. Learn about the intricate lives of these important widespread predators. All the World’s a Stage: Science and nature are full of stories. Join us to hear, create, and share stories about your wanderings and investigations at the Arboretum.